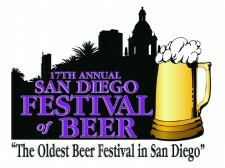 This year’s 17th Annual San Diego Festival of Beer will take over the streets at Columbia and B once more to bring you a fun-filled evening with over 6,000 beer lovers like yourself enjoying the sounds of live music while sampling from over seventy different breweries. We are expanding the festival this year to provide more space, more variety, and even more donations for local area cancer-fighting causes. Woohoo!! The admission price includes ten (4oz.) beer tastings. Inside the SDFoB there are food and munchies for sale in addition to a selection of fine wines for purchase by the glass. The first 6,000 guests will receive a free souvenir event logo tasting mug that is theirs to use throughout the evening and to keep when they go home. New pricing incentives this year! Tickets are $30 through July 31. In August, they climb to $35. By September, you will be making the generous donation of $40 to help our common cause. EXTRA TASTINGS available for purchase: 10 for $10, or 5 for $5. An ATM will be available within the event to allow for cash transactions to occur. TapHunter has generously agreed to donate a portion of the proceeds from sales of their “Straight from the Tap” deals available below. Buying through our link when a deal is offered means SDPAC benefits from your purchase, so thanks for your support!